Twin Cities protesters say “U.S. hands off Venezuela” | Fight Back! 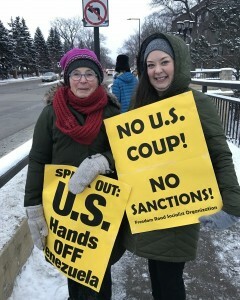 St. Paul, MN - On February 6 the Lake Street/Marshall bridge vigil focused on speaking out against U.S. intervention in Venezuela. Women Against Military Madness and Twin Cities Peace Campaign hold a weekly peace vigil on the Lake Street/Marshall Ave bridge over the Mississippi River. A statement issued by organizers says in part, "On January 23, 2019 President Trump recognized Juan Guaido, the president of the Venezuelan National Assembly, as the interim president of Venezuela. The Trump administration is orchestrating a coup against a democratically elected government and we are concerned that U.S. intervention will escalate into a military intervention or a civil war." Protesters held signs reading, "U.S. hands off Venezuela,” “No U.S. coup!” and “Stand with Maduro.” They got lots of car honks and thumbs up from drivers crossing between Minneapolis and Saint Paul. The action was also co-sponsored by the Anti-War Committee and Minnesota Peace Action Coalition. Minnesota Peace Action Coalition is organizing a follow-up protest on Saturday, February 23 as a part of a national day of action against U.S. war threats and the U.S. orchestrated coup on Venezuela. It will start at 1 p.m. at the intersection of Hennepin and Lagoon Avenues in Minneapolis.